Mysore in Southern India stole a little piece of our hearts and sucked us into staying there an entire month. It’s not necessarily that there are so many places to see in Mysore but the relaxed vibes, amazing food and culture of this city that make you feel like you’re at home and discovering vibrant, new cultures all at the same time. Mysore is famous for silk and sandalwood but there are many more exciting things to do in Mysore than avoiding the tourist scams at the silk markets. From the stunning Mysore Palace to creating crafts with local artisans you’ll want to spend weeks eating, discovering and exploring your way through Mysore. The is the reason most tourists visit Mysore and it’s one attraction that is truly deserving of its fame. The Mysore Palace was built in 1912 and for just 50 INR you can enjoy feeling like royalty and you wander through the ornately decorated halls and corridors. The palace is definitely one of the best places to visit in Mysore and should be top of you Mysore attractions list! Cost: 50 INR plus 285 INR (foreigners) for the residential quarters. We didn’t do this part. Ok technically this is the same attraction as number one but it ‘s a whole different experience. Every Sunday evening from 7 pm Mysore Palace is illuminated by nearly 100,000 light bulbs creating a spectacularly magical feel. Join the crowds of tourists and locals to wander the grounds of the palace and see it in a new light… literally. Be there on time because the illumination only lasts about half an hour. The markets in Mysore lack a lot of the hustle and bustle of other Indian cities but this makes them a pleasant place to wander and look without being crushed in a throng of people. Deveraja market is popular for fruit/veg, spices and oils. The area nearby has a huge collection of silk shops but beware of tourist scams. Mandi market is also interesting to wander with flowers, fruit and some handicrafts. If you feel like going somewhere a little crazy have a look for the metal market which sells the most impressive array of used car parts, old gates, doors and metal poles. Mysore is known for its local artisans who specialise in everything from woodwork and marquetry to copper work and embroidery. Skillstourism offer a brilliant tour where you can see all the artisans at work and learn about their crafts. Watch the intricacy of a scene being created from tiny wooden pieces in the marquetry workshop or gaze in awe at the hundreds of hand-carved wooden blocks used for printing saris on the 16ft long table. What seems like an ordinary neighbourhood comes alive as you go behind the scenes and see the locals at work. If you’re into art or local life and are looking for some different places to see in Mysore this is definitely worth doing. You can read more details on the Skillstourism website. 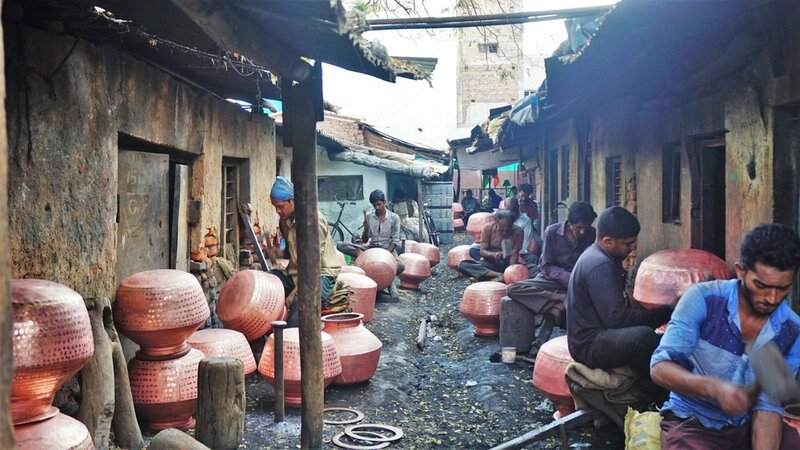 If the artisans inspire you, Skillstourism also offer tailor-made workshops run by the local artisans. In a one-day workshop, you can block print your own fabric or learn the basics of jewellery making. If you have 2-3 days you can get stuck into stone carving, marquetry (wooden inlay work) or metal work and create your own piece of art to take home. The courses are professionally and personally run and offer something different to the usual tourist attractions. Max and I chose our own fabric and paint colours, block printed our own designs and then had it tailor-made into clothing. It was such a fun and rewarding experience! The feeling of wearing clothing we’ve printed and designed ourselves? Priceless! Learn more about the craft workshops here. There are no less than seven palaces in Mysore so the feeling of royalty kind of rubs off. So don your best clothing, or dig your least dirty item out of the backpack and head to the Lalith Mahal Palace Restaurant for dinner. The dining room will make you feel like a king or queen for the evening and the food and service are great. Meals are more expensive than restaurants in town but still not ridiculous at about 350-450 INR per dish. If you’re feeling extra fancy you can even book a room. But make sure you do so in advance as it is often booked out for weddings and formal visits. Click here to check it out. Of all the things to see in Mysore, the streets are the most interesting. As with everywhere in India, the local life, buildings and food are more mind-blowing than any tourist attraction. Meandering through the lanes of Mysore you’ll see all kinds of daily life, excited children, grandmas having tea, cows, colourful washing, tiny shops, houses fashioned in the remains of abandoned colonial buildings and all kinds of food being prepared and enjoyed. So spend some time getting lost and discovering a different side of Mysore. Yoga is one of the most popular things to do in Mysore as world famous gurus reside and teach in the ashrams here during December and January. Even in the off-season when the Mysore weather heats up you can still find some drop in classes and teacher training courses. Gokulam is the yoga centre of Mysore so if you plan to yoga regularly then base yourself here. If you can’t afford to stay in a palace you will be able to afford to stay in a converted colonial mansion which is almost as cool. The Green Hotel has a range of private rooms, beautifully manicured gardens, a good restaurant and a café run by women from underprivileged backgrounds who have been trained by a French baker. Delicious cakes, relaxed surroundings and there’s even a small library. Check out prices here. For the more budget conscious check yourself in to one of the only hostels in Mysore, The Mansion 1907. This beautiful historic building houses several dorm rooms and a couple of spacious private rooms. There is free rooftop yoga in the mornings, amazing wall murals and a huge comfortable common area for hanging out. We made our home here for 4 weeks during our trip to India. Go there and you’ll see why. Book now. If you like the idea to staying in an old colonial mansion but don’t want the busyness of a hostel check out Laika Heritage Stay, a beautiful property. Continuing our discoveries of more off-beat areas of Mysore we learnt about Mycycle Tours. Stephen runs really interesting bike tours around the beautiful island of Srirangapatnam about 12 km from Mysore. Over the course of 3-4 hours you’ll learn about the history of the area and get to soak in some amazing scenes of rural life. Make sure you bring a camera and some sunscreen! The dosas in Mysore are some of the best in the country and a trip to Mysore wouldn’t be complete without indulging at least once a day. For anyone unfamiliar with this edible glory a dosa is a large, crispy pancake filled with various things. A masala dosa comes filled with a potato, onion and spice mix. Hotel Mylari is famed as being THE place to enjoy a dosa. We were staying a few minutes from here and while their dosas are good, we far preferred others on the same street which were crispier and tastier, but everyone has their own dosa preference! If you’re looking for some more places to eat check out any of these for great food and decent prices. Di Lemon – Great range of North and South Indian cuisine at really reasonable prices. Parklane Hotel - Decent North and South Indian food and beer towers! The Old House – Woodfire pizza for when you need a break from Indian food. A little more expensive but well worth it. Om Shanti – Amazing North and South Indian thalis and a cold stone ice cream stand outside. Hotel Guru – Authentic local thalis for just 50 INR. Absolutely delicious! Mysore is one of the few places in India where you can find real barista coffee. The mountain areas around Mysore are home to thousands of coffee plantations and the established yoga community means there is a good market for proper coffee. Depth ‘n’ Green – They have a full café with great food and an espresso bar for when you just need a caffeine fix. Rasa Dhatu - Great range of organic food including vegan options. Organic supermarket attached. Khushi Cafe - Service with a smile. Simple but delicious food, you can even earn your meal by volunteering for a couple of hours. The Green Hotel - Social project cafe in an old colonial mansion. Beautiful gardens and great cake. There are so many things to see in Mysore and the relaxed atmosphere of the city draws travellers in and a couple of days quickly turn into a couple of weeks here. So make sure you leave some time in your India to fall in love with Mysore and all it has to offer!